Wow! 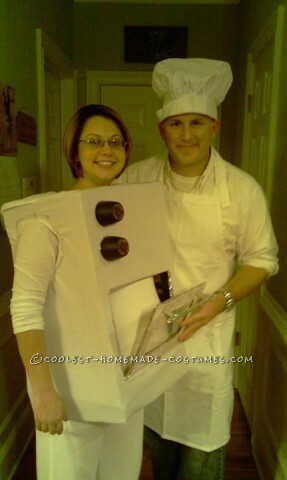 Everyone just loved this idea of a Bun in the Oven and Chef costume. My wife was very pregnant so it was a great idea. We took a box and cut it out then covered it with white fabric. We used spray paint lids for the knobs then printed out a picture to put on the end of the knob. We made a window out of plastic wrap and the handle to open out of glue sticks. This costume was a lot of fun.